If you’ve been following my healthy eating articles, you’ll be familiar with my whole foods guru, Lee. Lee and her sister, Amy, have produced the first in a series of DVDs that explore the fundamentals of whole foods cooking and eating. This DVD, subtitled Breads, covers the essentials of baking fresh breads for your family—everything from sandwich breads to tortillas—using soaked grains and entirely natural ingredients. It’s a very user-friendly format: after an introduction explaining why it’s important to understand the concept of soaked grains, there’s a menu that allows the viewer to choose any variety of bread. The opening screen of each segment presents the recipe for whatever is being demonstrated in that portion, so that it’s an easy task to have ingredients and tools ready ahead of time. Lee and Amy do an excellent job of carefully and thoroughly explaining each step of the recipe and why it’s important. They introduce ingredients and demonstrate machines and tools, sharing the benefits of each particular one. Together they present a compelling case for meal planning and the use of only fresh, natural food products. This style makes it easy to cook along with Lee and Amy, in effect presenting a living cookbook. If you’re not craving fresh bread right out of the oven. . .or cinnamon rolls. . or pancakes after you finish watching this DVD, you must not have been paying attention! 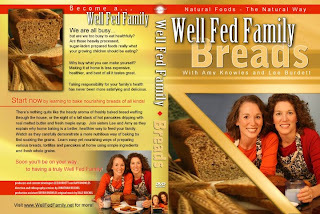 Lee Burdett, along with her sister, Amy Knowles, is the co-founder of the Well Fed Family website (www.WellFedFamily.net). The two also produced and starred in a recently released DVD that details the overall goodness of making your own bread at home, from fresh and natural ingredients. Lee presents Healthy Eating classes to small groups, wherein she shares her journey to whole foods and demonstrates tips and recipes. She graciously agreed to answer some questions about that journey. TTFM: What launched you into the practice of cooking and eating whole foods--how did you get started? Lee: The journey has two main starting points – while I was growing up my mother taught both of her girls how to cook. We both enjoyed the satisfaction and tastier results of cooking from scratch but would occasionally use convenience products as well. I was always an adventurous eater and cook; whenever I would discover a new food I would try to learn how to make it myself. Getting married and working full time changed the way I cooked due to demands on my time. I began running when I was 15 and after I got married I also began running in various races. This sparked my interest in eating for performance and health, which combined well with my earlier culinary experiences. When our children began arriving, it caused my sister and me to re-evaluate a lot of what we were doing. My sister began earnestly searching for non-medical solutions to some health issues they were facing, and she discovered we could be doing so much more for our health than we were currently doing. She was the first to purchase a grain mill and commit to making her family’s bread rather than buying it. It seems one commitment led to another, and after reading Ruth Yaron’s Super Baby Food I was inspired to really take control over my own family’s food. Making baby food was easy and much cheaper than buying those little jars. From those first “baby steps,” it became a constant learning process that continues to this day. The goal is to take back control of our health and well being through taking control away from commercial industrial “food”. My sister and I are always learning new ways to do things, healthier ways to cook and sharing them with each other and anyone else who will listen. TTFM: Can you give us a definition of whole foods, from your perspective--in other words, how do whole foods and healthy eating translate into your family's life? Lee: Whole foods are foods that are as close to the way God made them as possible. In our day-to-day life, we strive to eat foods that have been processed very little if at all. Ideally we ourselves are the ones who do the processing – when you cut an apple you have processed it in a very simple way – not relying on a company to process things for us. We seek out sources for our food that come from people we know we can trust, who have integrity and who do things the way we would do it if we could do it ourselves. I teach my children how to cook; I want them to be able to feed themselves wisely and well when they grow up. They are already avid label readers and can spot artificial ingredients and additives with skill and accuracy! TTFM: How did changing how you cook and eat change your life and your family's life? Lee: For one thing it has helped me to be able to stay at home with my children. I don’t think people realize how much money is spent NOT cooking for yourself. Restaurants, fast food, convenience foods from the grocery store – they are all very expensive and usually not very healthy. We save money up front by planning meals and cooking at home, and we save money in the long run by not having constant medical bills piling up. I look back at the records from “before” and see month after month of antibiotics, ear infections, allergies, flu, etc. and realize just how sick a “normal, healthy family” can be. Now I can honestly say I cannot remember the last time either child or adult in our family had to take an anti-biotic or any other prescription medication for typical illnesses. The same transformation has happened with my sister’s family. When we do catch something we are able to bounce back and recover quickly. We haven’t had over-the-counter cold medications in our house for years now. TTFM: For a family just starting the journey of healthy eating, what would you suggest as the most important first steps? Lee: First steps would be to get rid of all the dangerous stuff lurking in your cupboards and refrigerator. Be an avid label reader, tossing out anything with artificial colors, artificial flavors, chemical preservatives or artificial sweeteners. It was reading the labels on store-bought bread that caused me to make the initial commitment to learning how to make my own bread. It is so easy and much less expensive to make your own with almost any kind of bread product from sandwich to muffins to tortillas. I even do crackers now. The DVD is a great first start tool for families who want to take control of their health. Toss out the rancid, refined liquid vegetable oils and replace them with unrefined nutritious oils like extra virgin olive oil and extra virgin coconut oil. Use organic butter in place of the margarines and “healthy spreads” whose ingredient lists read like a chemistry textbook. Once you’ve gotten rid of the junk bring in only real food. Plan your menu each week, make a shopping list and prepare yourself so you can eat well and healthfully without getting caught at the last minute without a plan for dinner. TTFM: Your first DVD is all about breads and baking. What comes next? The Well Fed Family website http://www.wellfedfamily.net has a lot of information for people who are starting out on the healthy eating journey. 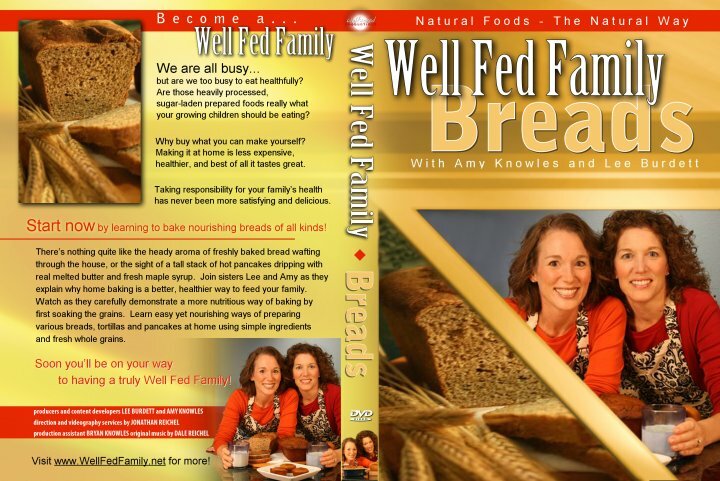 The Well Fed Family: Breads DVD is available for purchase on the website under the “education” tab. Website content is updated once a month. The Well Fed Family is also on Facebook where you can find resource listings for local farmers markets, farms, stores and co-ops. There are also recipes and tips on the FB page. It’s a great place to ask questions as there are quite a few knowledgeable people available there to answer quickly.